Final part of our gold-from-glyphs series. 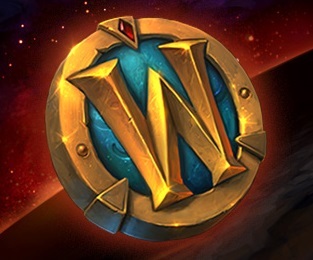 TSM3 Inscription Guide. With full pictures. You have glyphs in your inventory. 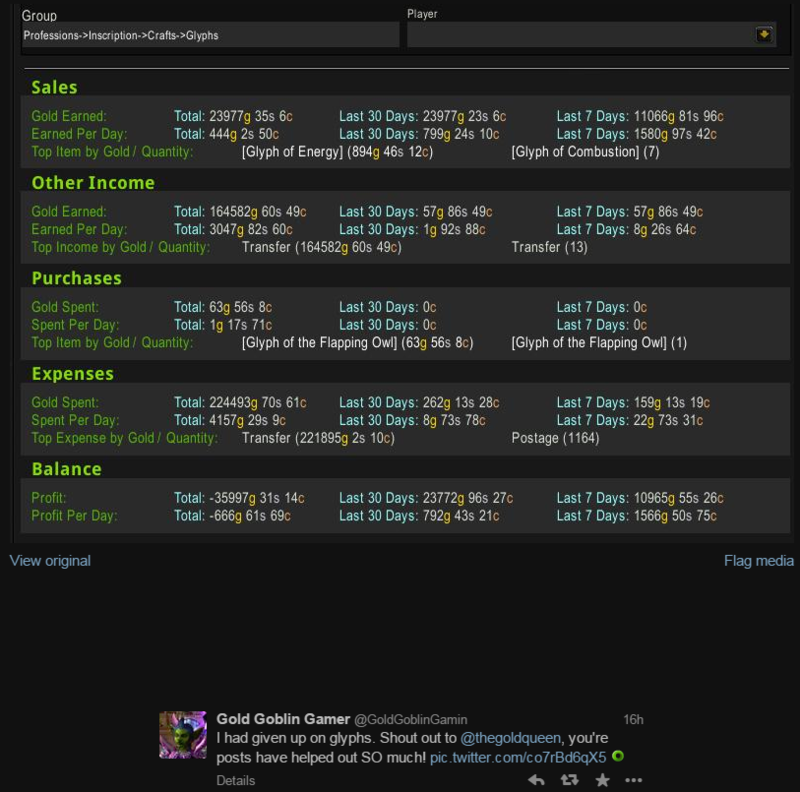 The TSM glyph group has a posting operation attached. Ok let’s go! 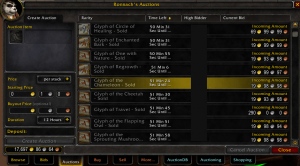 Head to the Auction House! Open the Auctioning Tab at the bottom. 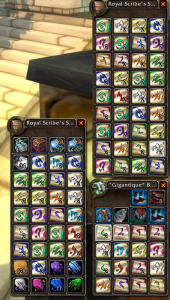 Find your group (Glyphs) It may be hidden under Professions > Inscription > Glyphs like mine. Make sure it is highlighted. For even faster posting, make sure you have deselected other groups. Click Post or use your macro-keybound mouse scroll wheel to post even faster. Your glyphs are now posted. 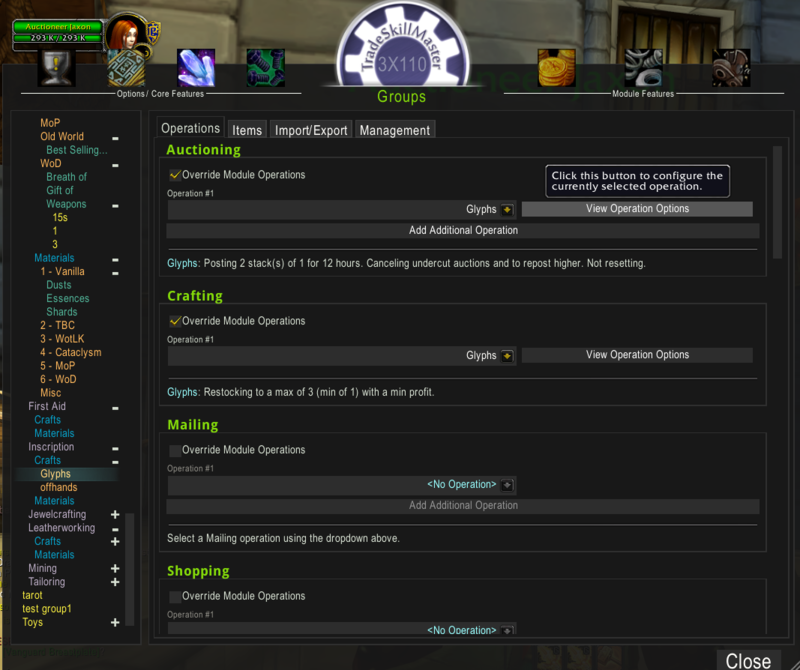 You can choose to either babysit your glyphs, cancelling and reposting constantly, or to simply leave them. Experiment to see which suits your playstyle. For a passive income, I would only do this “babysitting” about once a day. Head to the AH. 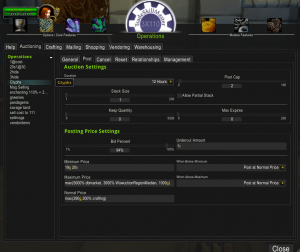 Open the Auctioning tab again. 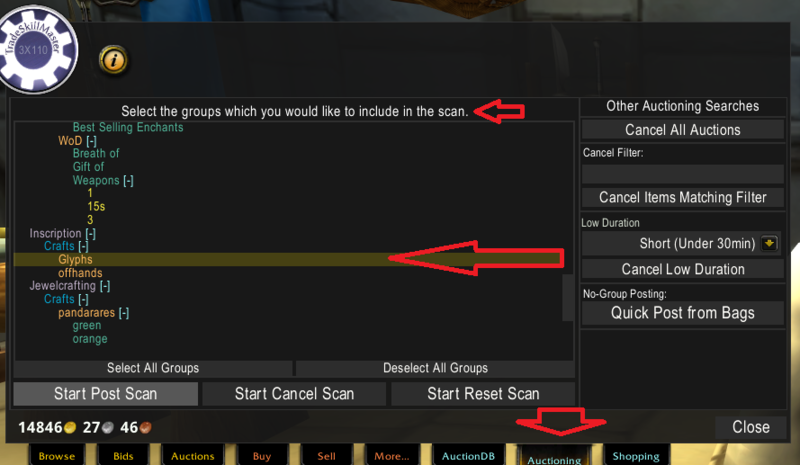 It scans your auctions for undercuts. Grab your cancelled glyphs from the mailbox. Run, don’t walk, to the AH. Post them on the AH just as described above. 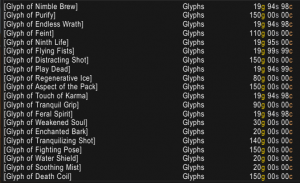 Why store all the glyphs? 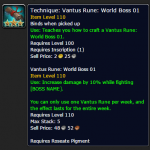 It means that when your glyphs sell (YAY!) then instead of having to find the cheapest herb costs, mill into pigment, make ink, and craft the glyph, then the glyph is ready and waiting for sale. No need to be at the mercy of the herb prices. 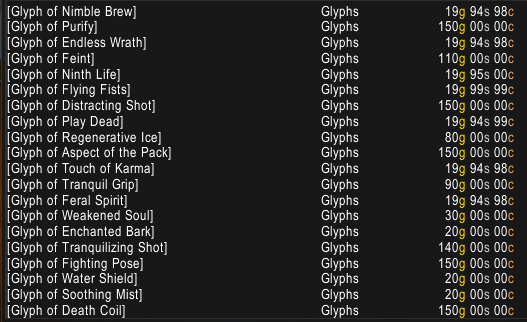 You can buy the herbs for your glyphs when they are cheap, and ignore herb prices when they are high because you don’t need them. A few silver difference per herb price, for the tens of thousands of herbs you will need, will save you a fortune. 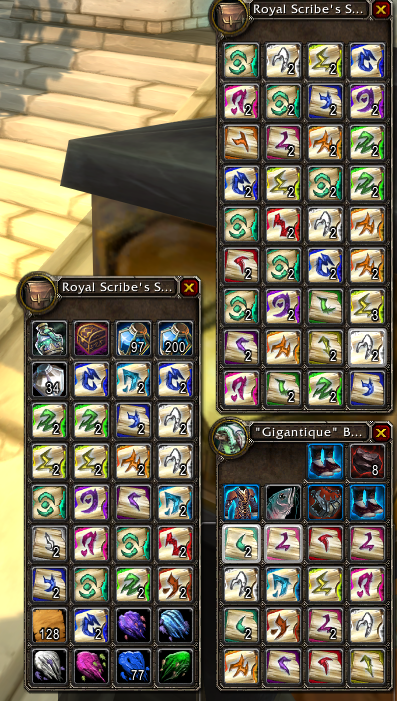 And that fortune saved will become gold in your pocket when your cheaply-crafted glyphs sell. 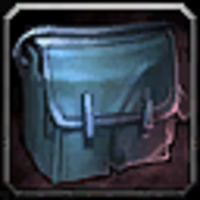 Take your bag with excess glyphs to your guild bank vault. 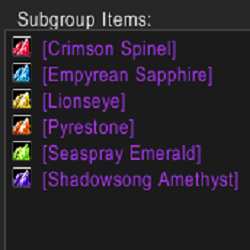 Change one of your guild bank tabs to a nice looking inscription or glyph image if you want. 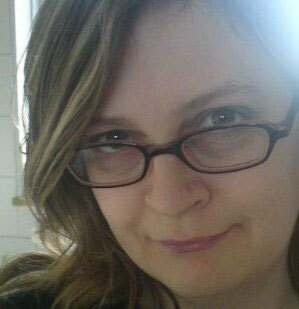 You’ll probably need more than one tab, I’ve used up to 4, but I’m pretty untidy. If the TSM Bank user interface doesn’t come up with you open the guild vault, type /tsm bankui You can move the bankui around with your mouse, if it is in the way of your bags or bank. This is what is looks like with TSM3. 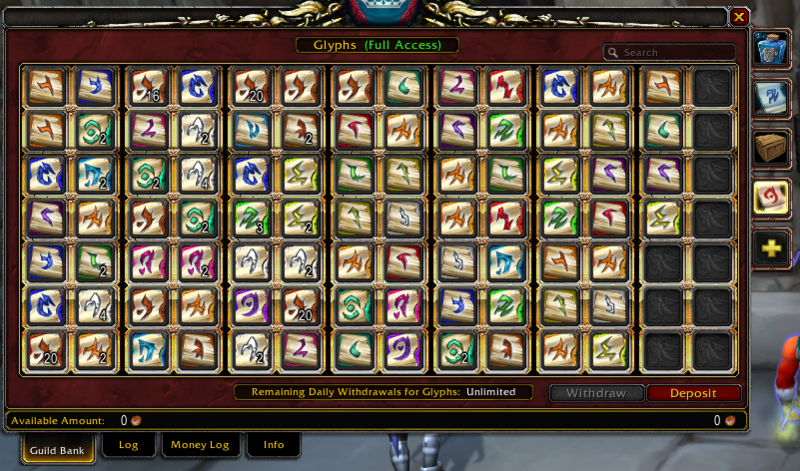 As you can see, I already have some glyphs stored in the bank. 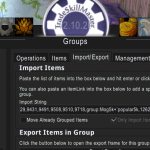 Under the Warehousing tab on the TSM Bankui, make sure that the only group you have selected is “Glyphs“. 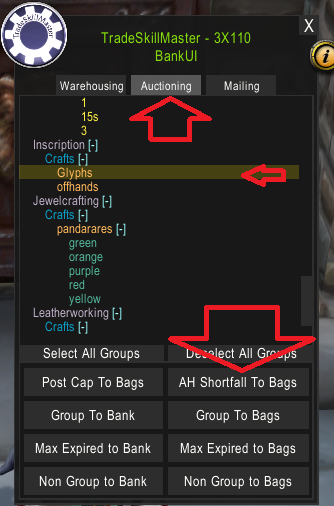 Deselect all groups if necessary then click the name of the group to highlight it. 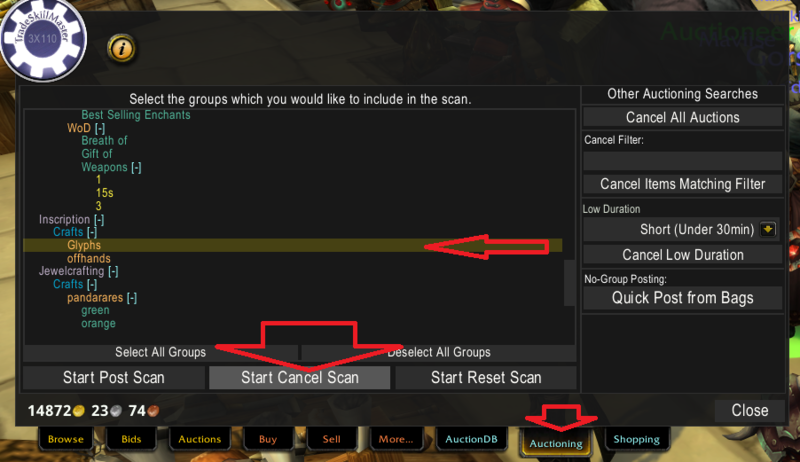 Then click Move Group to Bank. 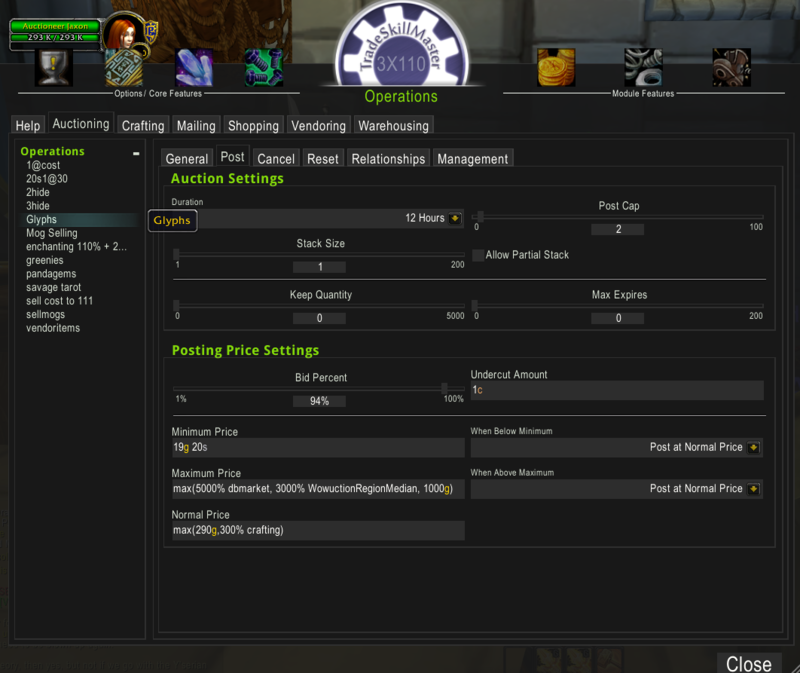 Your buttons might look different, but they will look like this in TSM3 and have the same functionality. 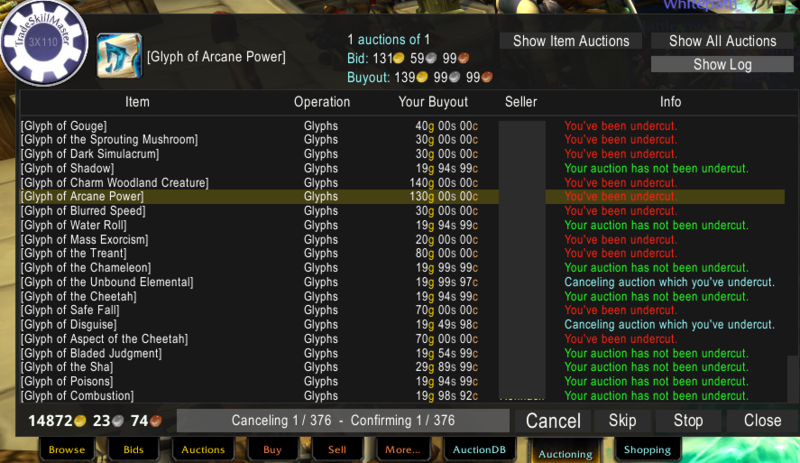 This moves all the glyphs that are required by the Auctioning operation of the group you selected (Glyphs). 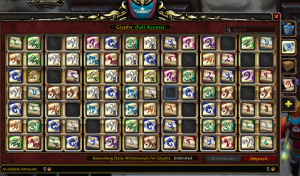 Take your inventory of glyphs and post it on the AH. 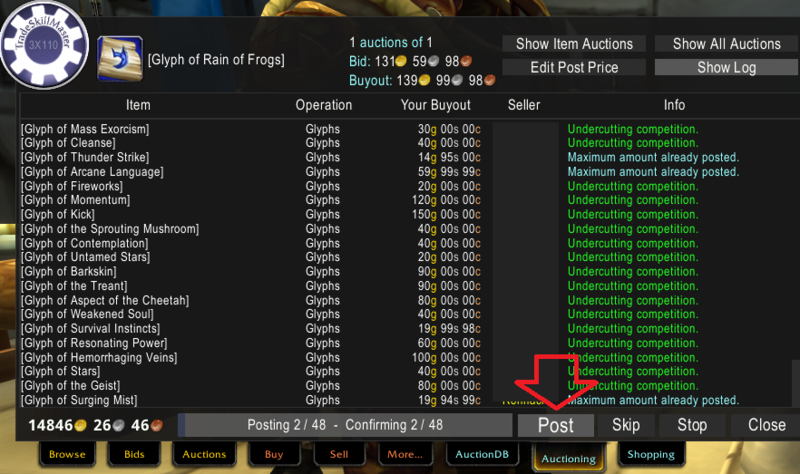 Sometimes your glyphs will sell for very little profit. You pay up to 18g for them, and they sell for 20g. This worries you. 2g is still profit. 1,000 x 2g = 2,000g. 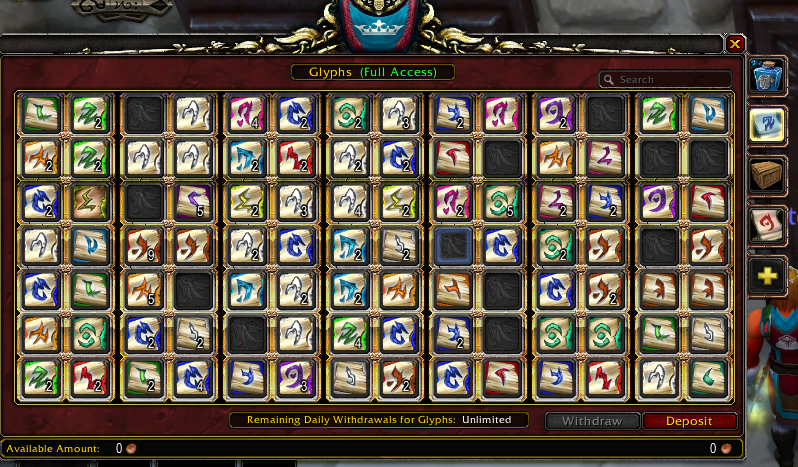 Some of the glyphs will sell for higher. Much higher. And this is all pure profit. 1,000g x 200g = 200,000g. Posting every glyph in the game means that whichever glyph your customer wants, you have it. You can have their gold. 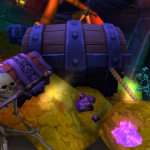 Your competitors are not getting that gold, and therefore have less buying power for the mats (herbs). 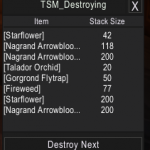 Your competitors may go and start farming herbs. Which gives them less time at the AH babysitting their glyphs. Which means you sell even more. You have a bank full of glyphs. 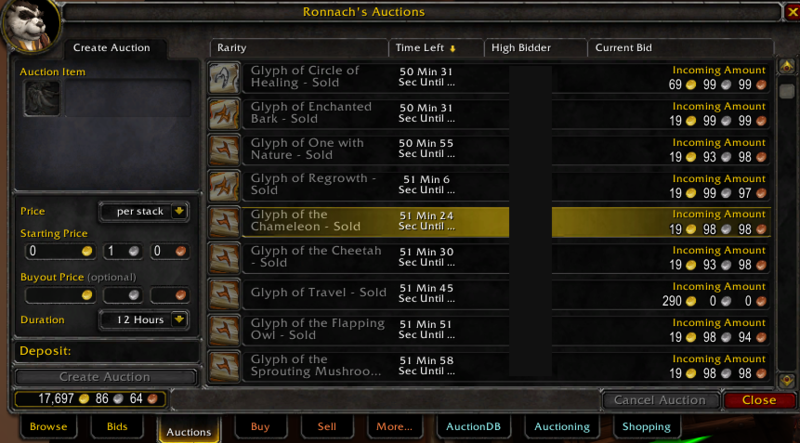 Glyph prices are not dependent on herb prices. 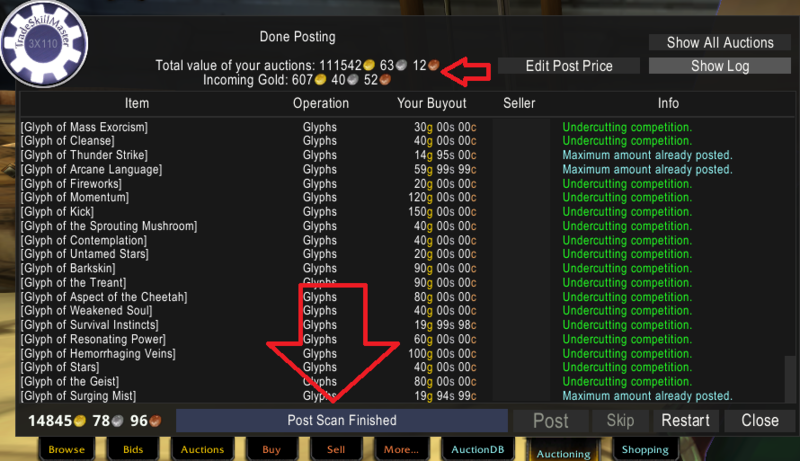 Once your cheap glyph has sold, your next glyph of that type might sell for much more. You’re building a long term income here. You’re looking for 30,000g per month. So your income should be 1,000g per day. 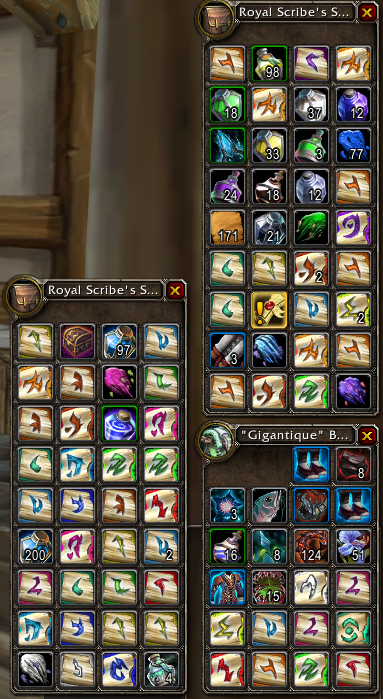 That’s perfectly doable on the profits of the cheap glyphs alone. 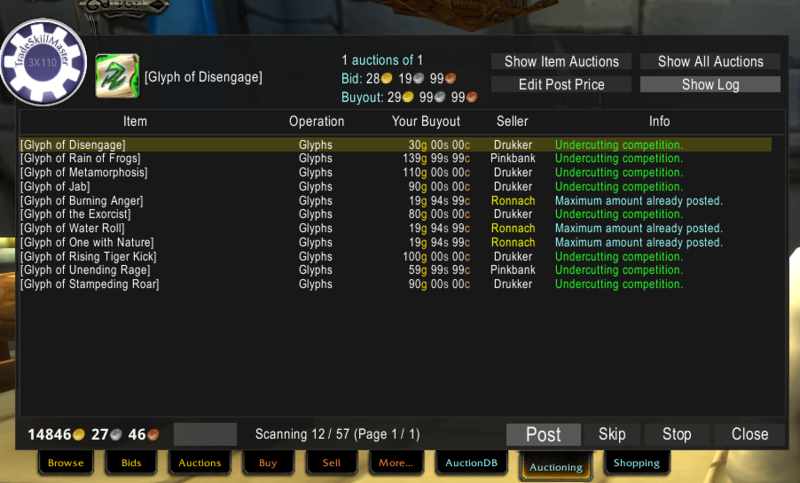 The higher priced glyphs are a bonus. Most of the time, you will not pay 18g for the mats to craft the glyph. Your average purchase cost might be only 10g. Which makes 20g double your money. This is *NOT* meant to be your biggest gold maker. Glyphs are not a big gold maker. 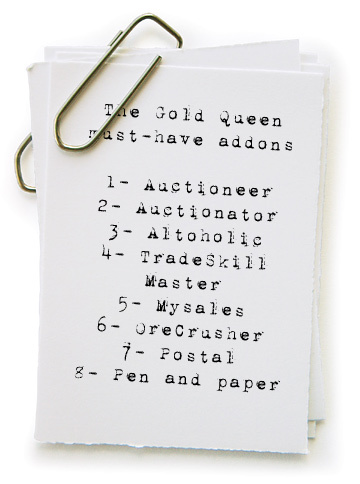 But they are easy to automate and they are easy to create a passive income. Don’t give up on Glyphs, or you will miss out. 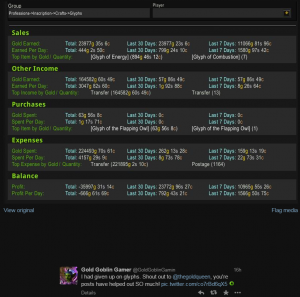 Finding old items in guild banks for sale, using TSM3. 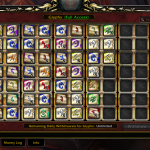 Are you a Hoarding Horde? I’ve been out of the glyph market for six months or so as my sales had crashed to a pitiful level. But heard you on Jim’s podcast so came to take a look and got inspired to give glyphs a second chance. And i’m pleasantly surprised. Have made more than 1k a day, though all of it has been reinvested in more mats and stock for now. 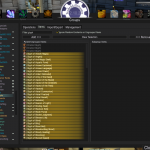 I suspect that the content lull has pushed people into rolling alts – and i see more talk of twinks in trade chat than i have seen for a few years, So i really should have been paying attention to the ‘vibe’ on the server and got back into glyphs months ago. 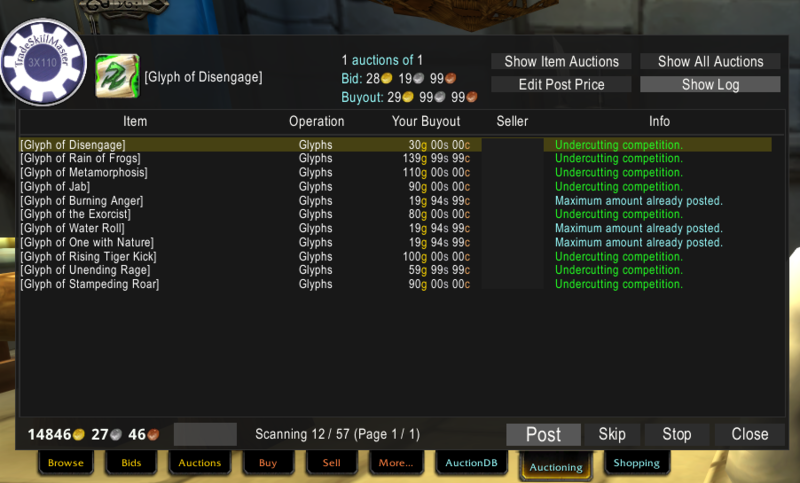 But i;ve never run a stock surplus before – always posted 2 glyphs, maybe three for big sellers and crafted on demand. I’ll see how much easier the GB stock holding is. Thank you for coming over and for commenting, and I’m glad you gave them another try. True, glyphs won’t make you a millionaire overnight, but I think they’re still good gold makers and glad to work them into your routine. The bonus about keeping a stock is that you can replenish AH instantly, and that you can dont have to make ink out of the herbs at the current AH price, instead you can get them when they’re cheaper. I think that’s probably a question for Zygor.